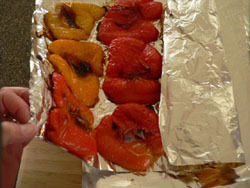 While the oven is preheating, line a baking sheet with foil. Wash bell peppers. 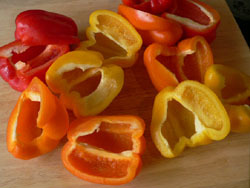 Cut the peppers in half and discard stem and seeds. 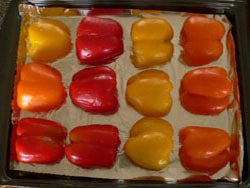 Place the peppers on the foil lined baking sheet and place the baking sheet in the oven. After the first 20 minutes, turn the peppers so that they aren't lying on the same side throughout the entire roasting period. After another 20 minutes, turn the peppers again, this time cutting the edges to press the pepper flat. The skin should be starting to wrinkle and blister, it is ok if turning brown in spots. Try to make sure that the peppers rotate evenly throughout the process. After an hour, Open the oven and check the peppers. They should be evenly browned and blistered. 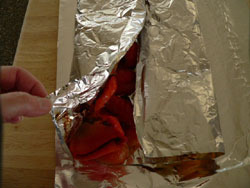 Take the corners of the foil and fold with peppers inside. Seal the ends tight to keep the steam in. 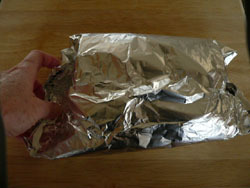 Use an extra piece of foil if necessary to secure the bundle and let sit for about 30 minutes to steam itself. This will make the peelings come off easily. The peppers will have cooled enough now to start peeling them. Open the foil and work right over the foil. The peel should come right off when you lightly press between your thumb and fingers. 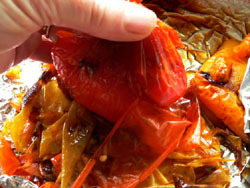 I do this right over the opened foil and having a clean plate ready for the peeled peppers. Once all are peeled, just roll up the foil and toss. Here are a few ideas on what you can use them for. And once roasted, the peppers freeze great to have on hand at a moments notice. 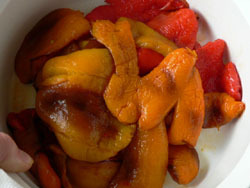 Combine ingredients in a food processor and puree until smooth. Spoon on slices of bread or dip you favorite chip in it. 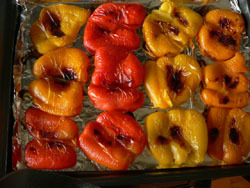 Put all in a zip lock bag, toss to mix and coat the peppers evenly. Chill. Use on salads, sandwiches, pizzas.... it's endless what you can use these tasty treats on.